This month we have a Holiday Special Offer for you at the bottom of this update, offering you the opportunity to invest in some limited smaller size lots on our orange farm at a special price. Attending the NOIC was a great opportunity for us to introduce our agriculture programs to a new group of investors looking for portfolio diversification with alternative assets. Along with the very dynamic group of speakers that were featured, we were able to meet with Russ Grey and Robert Helms from “The Real Estate Guys Radio Show”. (pictured below: Daniel Nance, Robert Helms, David Smith). 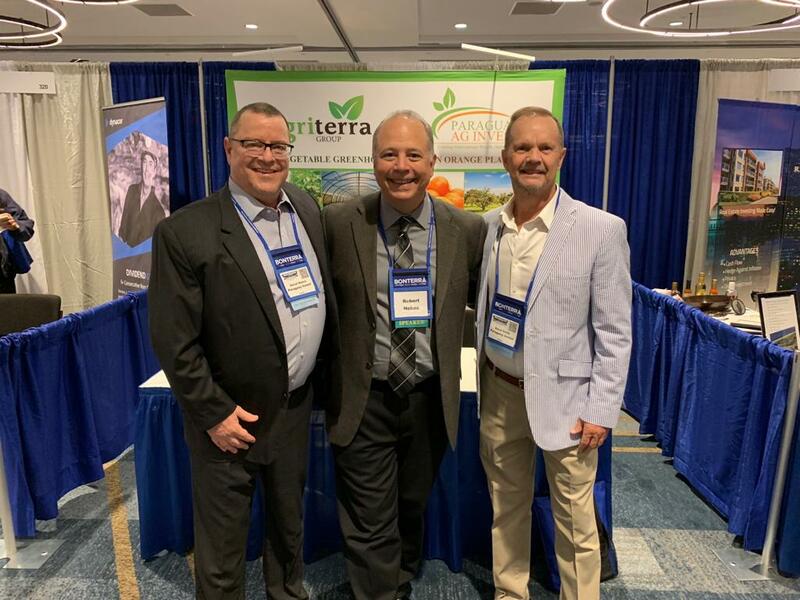 Robert and Russ have been instrumental in providing us with a platform to educate investors about the benefits of investing in food and the opportunities our agriculture programs in Paraguay offer. According to the report “World – Oranges – Market Analysis, Forecast, Size, Trends and Insights”, recently published by IndexBox, the global orange consumption reached 75M tonnes in 2017, going up by 2% against the previous year. The total consumption volume had been increasing at an average annual rate of +1.2% from 2007 to 2017 (read more). While this is obviously positive news for our investors, please note that we actually don’t need to rely on exports to sell our harvest. Paraguay’s high local demand means 80% of oranges currently need to be imported. Our controlling stake in the 4th largest local distributor also gives us direct access to the local market. With 10.4% growth, Paraguay was the second fastest growing economy worldwide and since 2012 has been rated as a stable economy. The country’s recent election results confirmed that Paraguay’s business-friendly environment and economic growth will continue. We highly recommend watching this 3 minute video by the ministry of industry and commerce about investing in Paraguay. Orange Farm – Holiday Special Offer! We are making a limited amount of smaller sized lots (between 2,500 and 2,600m2) available at a discounted price of $16,500 + 2% closing fee. This land is already cleared and prepared. The saplings have been ordered as well and are scheduled to be planted in March & April 2019 (i.e. 4 months earlier than normal). We expect these lots to be very popular so they will be sold on a first come, first serve basis. However, we appreciate that with the holiday season on the way, there’s a general preference not to make investment outlays in December. You can reserve your now with a signed contract, and delay payment until January. Thank you again for your interest in our agriculture opportunities. As always, don’t hesitate to contact us for further information, or to organize a visit to our farms in Paraguay. The Agri Terra & Paraguay Ag Invest Team!